1. Preheat oven to 375°. Melt 2 Tbsp. butter in a medium skillet over medium heat; add onions, and sauté 10 to 12 minutes or until tender and onions begin to caramelize. 2. Spoon onions into a 10-inch quiche dish coated with cooking spray. Toss together potatoes and next 4 ingredients. 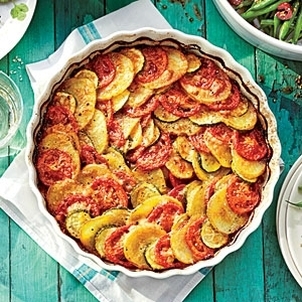 Arrange potatoes, zucchini, and tomatoes in a single layer over onions, alternating and overlapping slightly. Drizzle with 2 Tbsp. melted butter. Cover with aluminum foil. 3. Bake at 375° for 30 minutes. Remove foil, and sprinkle with cheese. Bake 35 to 40 minutes or until golden brown. Let stand 10 minutes before serving.